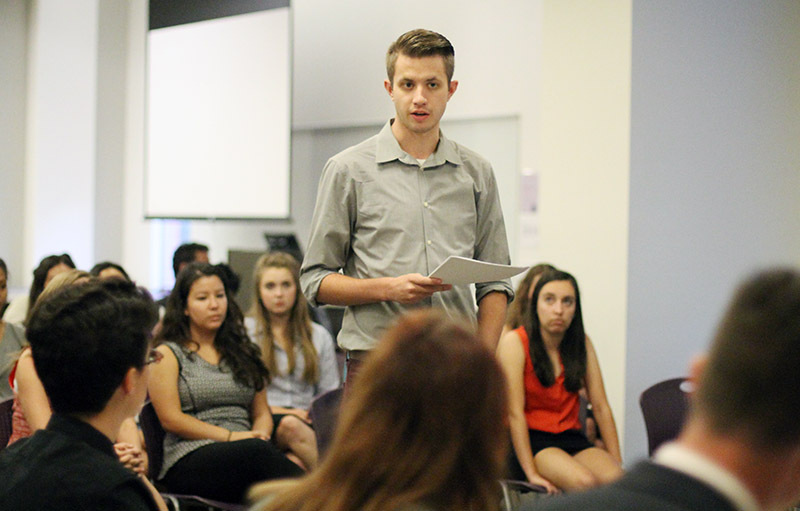 ASGCU President Slate Herman addresses the senate Tuesday at the student government meeting. 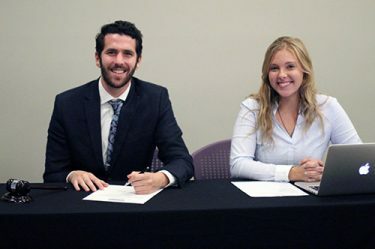 In response to student population growth, the Associated Students of Grand Canyon University (ASGCU) passed the University’s first-ever constitution Tuesday night. The constitution, written by ASGCU president Slate Herman, his predecessors, student government staff and University leaders, was a project that took roughly three years to complete and was introduced because of the increased number of students on campus. 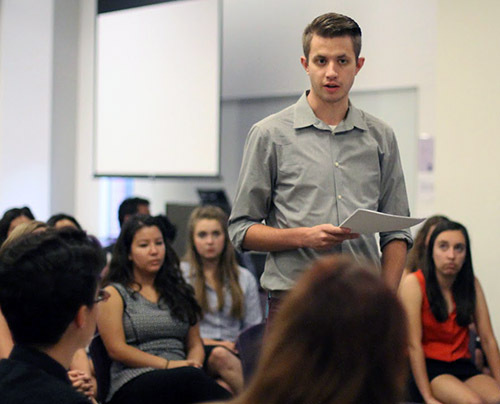 ASGCU is the primary student advocacy group on campus. “What we have is really a holistic document that we can be held liable for years to come,” Herman said. Vice President Nick Loudon (left) and Senate Outreach Coordinator Camillia Bonasera-Vrh flash a smile before Loudon signs the constitution. Key elements of the constitution explain the role of the student body president, the role of the student senate and the rights of students. It will be posted on asgcu.gcu.edu along with a set of bylaws. Herman said that while he doesn’t believe that the University infringes on any rights of the students, he wants students to know the roles that are given to them on behalf of the student government. Alysha Clark, chief of staff for ASGCU, is in her fourth year with the group and said she has watched students’ appreciation for the student government organization continue to grow, especially through its various campaigns, causes and partnerships on campus. That includes the “It’s On Us” movement, a nationwide rally to prevent sexual assault and create a community of active bystanders. According to Clark, ASGCU has grown into an organization that cares for students in a “focused” and “pointed” way because of its own increase in members.